I just completed the first ship from the Roman Navy set. I chose the Trireme - which was a good choice as it is one with outriggers for the oars. Only the larger ships have outriggers - the smaller ones have the oars attached directly to the underside of the deck. 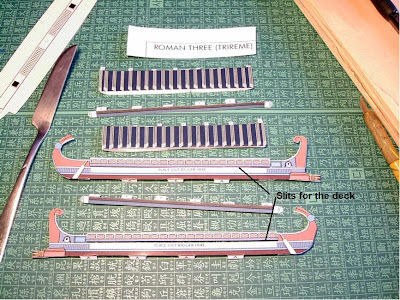 The Trireme is about 6 1/2 inches long - counting the ram. It's the smallest of the larger ships - which include the Quadreme, Quinquereme, and the flagship Hexeres. The Hexeres is just shy of 9 inches long. 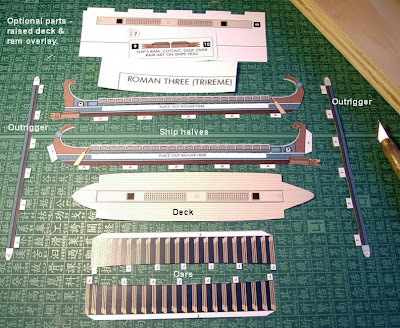 Here's the sheet of the Trireme - the larger ships have one ship per sheet. The smaller ones have three to four to a sheet. There is a list of tools needed for construction. I used a hobby knife (new blade), cutting mat, scissors, and a metal straight edge (actually a sheetmetal piece to be used as a movement tray). I also used Elmer's White Glue, watered down and applied with a small brush, for gluing the parts together. Here are the parts cut out. A straight edge was used for most of the cutting. 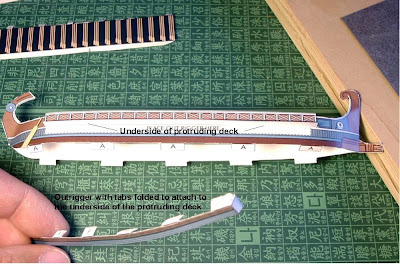 A pair of scissors was mainly used for the deck, which is a bit curved. A hobby knife was used for cutting the curved bow and stern of the ship. There are optional parts for the inside of the ship which I didn't print out. I think I'll add them to the larger ships. There are towers & commanders tents, as well as Corvus for larger ships, which again I didn't print out. This photo shows the the parts with tabs needing folding. As recommended in the instructions, I used a dull-blade (butter knife) to crease the folds. Outrigger ready for attachment to the underside of the deck protrusion. This is the trickiest part of the gluing process. You need to ensure all the tabs are lined up, especially the two end folds. Not at all hard though. Oars attached to the inside of the outrigger. 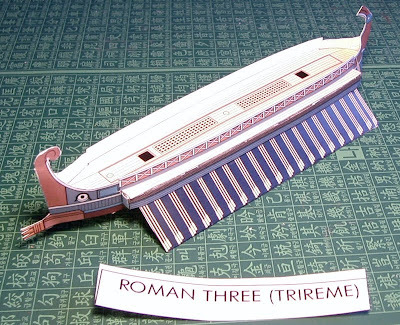 Trireme completed, less optional items like inner panels, sails, and towers. These can be placed on later. It will also need to be mounted on a movement stand. Now that I know the hands on process, the rest of the fleet should be put together a little faster. Great job! I've put together most of the buildings in my set. But I haven't even started on tackling the ships yet. Have you looked at colouring the edges of the paper where the cuts show? 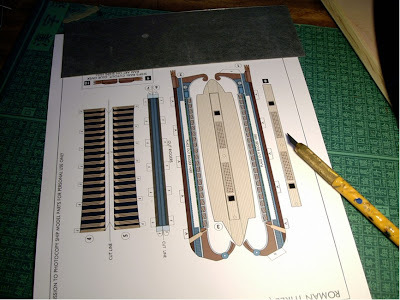 I have done this on plastic kits such as the Pirates of Constructable series ships. Not sure what thinkness of paper you have used here as well. Thanks Ted. BTW, did you also order a hex mat too? if so, what size hexes? I have one 6'X4' with 5" hexes. I was thinking of coloring the edges - either the same color as the edges or a darker/maybe black. I used 60lb. paper as that's all my local Staples had - the next closest was 100lb. ; and 80lb. is the max recommended. I plan to get some spray adhesive & add regular printer paper (20lb.) or a sheet of manila folder to the bottom of the decks of the larger ships. I also plan to spray them with Krylon clear matte after I mount them. Why not try printing one out on colored paper to avoid the white edges? All you'd be out is a sheet of paper and some ink. where did you get the print out of the ships?